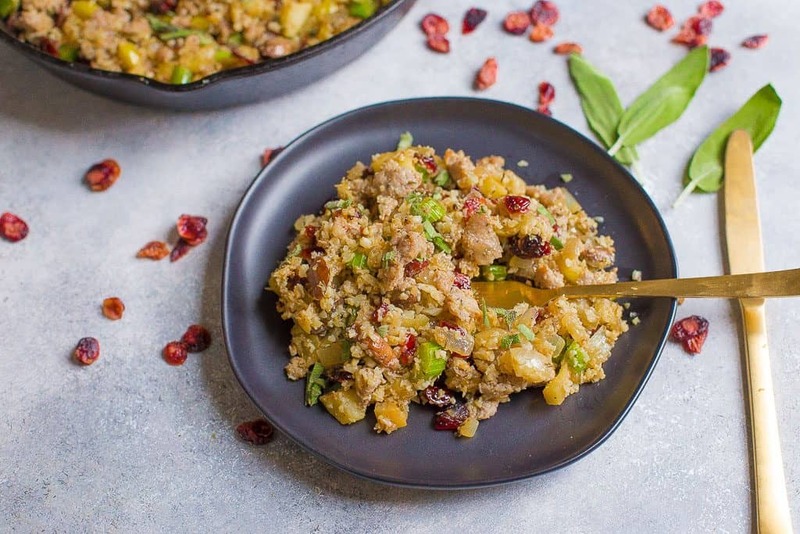 Cauliflower Rice Stuffing with Sausage is going to be your new favorite holiday side dish!! 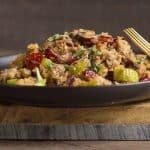 You’ll love this grain-free variation packed with earthy flavors and tangy sweetness of apples and dried cranberries. 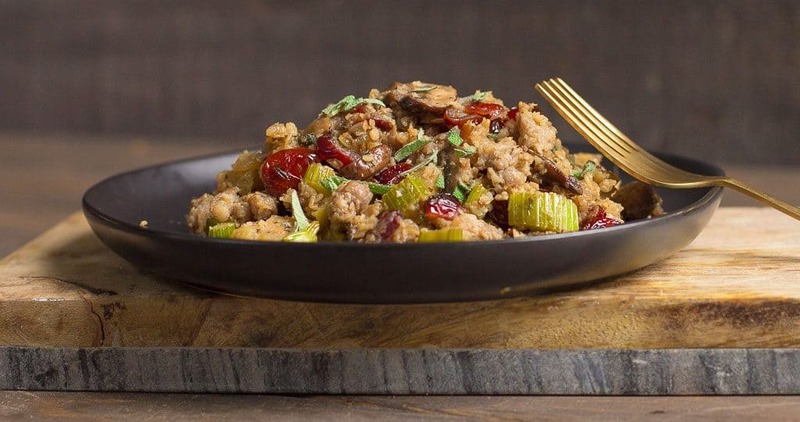 STUFFING, is my favorite Thanksgiving side dish!! Forget the turkey you guys, I can totally do without it. What I can’t do without, is my beloved stuffing. I actually didn’t love Thanskgiving stuffing until I was an adult (thanks to my parents who served stovetop for years, haha). I’ll never forget my first “Friendsgiving” as a married couple. 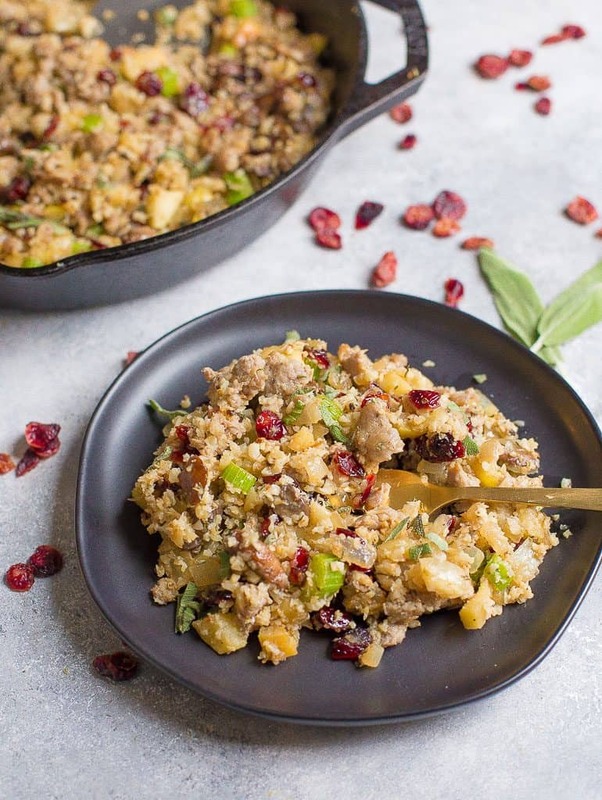 One of my friends brought over this amazing stuffing with all kinds of goodies: sausage, apples, celery, cranberries, and all topped with fresh sage. I was HOOKED. Now flash forward many years later, and I am pretty much against all bread. Nothing against my friends who love bread, it’s delicious. But my body doesn’t love it so much. Soooooooo, I put all these goodies in some roasted cauliflower “rice”. I can’t take full credit for this recipe for a few reasons. First, the idea didn’t even occur to me to try Cauliflower “rice” stuffing until last week while sampling yumminess at Trader Joe’s. So yeah, TJ’s is way ahead of the game. 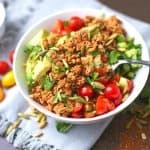 They have a frozen cauliflower rice stuffing that was pretty yummy, but I was still thinking back to my original recipe from my friend, Kim. And I knew it would all work well together. I pretty much made the best cauliflower rice dish EVER. And that is saying a lot, because my site is full of cauli rice recipes. But this one is my absolute favorite! So good, that even the husband who doesn’t like cauliflower rice thought it was super delicious and deemed it a perfectly acceptable dish for our Thanksgiving table next week. I think it will be perfect for your table too! One of the reasons why this dish tasted exceptionally delicious, was the roasting of the cauliflower rice, before combining it to the goodies. So much more flavor! Also for reference, unlike a bread stuffing this stuffing tastes delicious re-heated the next day. 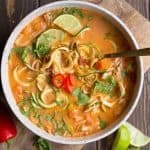 So easy to make in advance! 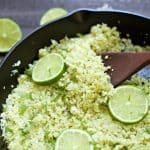 Prepare your cauliflower rice: Dice your cauliflower head into florets. 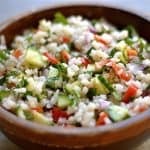 Place in batches in your food processor (may take 3-4 batches), and pulse until the texture or couscous or rice is reached (don't over pulse!). Spread cauliflower rice over the baking sheet and coat with oil. Sprinkle with salt and pepper. Place in the oven for approximately 25 minutes to roast. About halfway through cooking, turn the rice to cook evenly. Remove from oven and set aside. Meanwhile, make the rest of the stuffing. Heat a large skillet to medium high heat. Add another tbsp of oil to pan, and begin to cook sausage. Once cooked all the way, remove to a plate and drain some fat (leaving residual fat in the pan). Now add in a tbsp of ghee or oil to the hot pan, cook the onion and mushrooms for 5-6 minutes. Add apples and celery, cooking for another 3-4 minutes, adding more ghee if the pan is too dry. 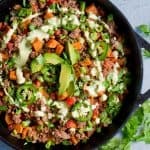 Now toss the sausage and cauliflower rice into the same skillet, turn to incorporate all ingredients evenly. 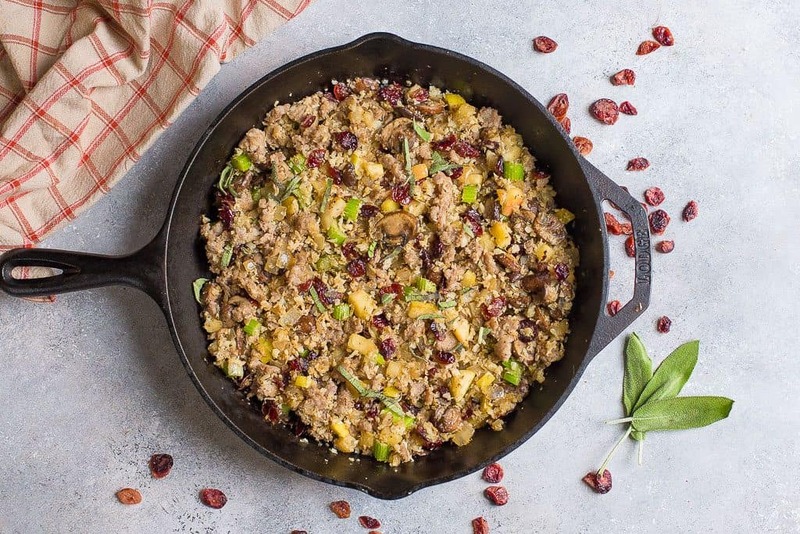 Remove from heat, add dried cranberries, fresh sage, and salt and pepper to taste. Serve hot, or re-heat and enjoy later. 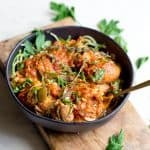 Can be made a day ahead and reheated on a skillet or in the oven. 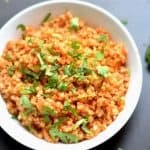 After I tasted it, I finally understood why people are so obsessed with cauliflower rice. Do you think omitting the mushrooms would hurt this dish? I cannot eat mushrooms to save my soul, but I’m dying to try this recipe. Thoughts? Is the sausage is of the casing? Apologies if I missed that, but I don’t see it. I use ground sausage, but you can buy links and take it out of the casing. Made this last Thanksgiving too, using all the same ingredients. However, rather than “rice” the cauliflower, this year I cut it in little bread cube-like sizes and it looks like bread and just a bit chunkier than having it “riced.” The riced cauliflower seems to just melt away into a mush. This is a more chunky version that holds together well.